Carl-Gustaf Rossby was Professor of Meteorology at University of Stockholm (1947-1957). Other institutional affiliations included University of Chicago, United States Weather Bureau, and Massachusetts Institute of Technology. His research interests included polar front theory, atmospheric flow, atmospheric turbulence, dynamics of the stratosphere, thermodynamics, ocean currents, jet streams, and vortices. December 28, 1898Birth, Stockholm (Sweden). 1918Obtained Filosofie Kandidat, University of Stockholm, Stockholm (Sweden). 1918 – 1921Assistant and Meteorologist, Geophysical Institute, Bergen. 1921Staff Member, Geophysical Institute, University of Leipzig. 1922 – 1923Meteorologist, Swedish Meteorologic-Hydrologic Service. 1925Obtained Filosofie Licentiat in Mathematical Physics, University of Stockholm, Stockholm (Sweden). 1926 – 1927American-Scandinavian Foundation Fellow and Junior Meteorologist, United States Weather Bureau. 1927 – 1928Chair, Committee on Aeronautical Meteorology, Daniel Guggenheim Fund for the Promotion of Aeronautics. 1928 – 1941Associate Professor of Meteorology (1928-1932) and Professor of Meteorology (1932-1941), Massachusetts Institute of Technology (MIT), Cambridge (Mass.). 1932 – 1957Research Associate, Woods Hole Oceanographic Institution. 1939 – 1941Assistant Chief for Research and Education, United States Weather Bureau. 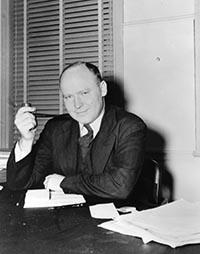 1941 – 1951Professor of Meteorology (1941-1943) and Andrew MacLeish Distinguished Service Professor (1943-1951), University of Chicago, Chicago (Ill.). 1947 – 1957Professor of Meteorology and Director, Meteorological Institute, University of Stockholm, Stockholm (Sweden). August 19, 1957Death, Stockholm (Sweden). Graduate advisor at Bergen School of Meteorology. Advised by Rossby at University of Stockholm. Advised by Rossby at University of Chicago, "On disturbances in the Easterlies." Advised by Rossby at Massachusetts Institute of Technology (MIT), "The Changes in Air Masses During Lifting." Advised by Rossby at University of Chicago, "Upper-air trajectories and weather forecasting," and both employed at University of Chicago. Advised by Rossby at University of Chicago, "Physical processes associated with summer stratus in southern California." Advised by Rossby at Massachusetts Institute of Technology (MIT), "The development and present status of the theory of the heat balance in the atmosphere." Advised by Rossby at University of Chicago. Spilhaus, A. F. (Athelstan Frederick), Jr. Advised by Rossby at Woods Holes Oceanographic Institution. Advised by Rossby at University of Chicago, "A quasi-Lagrangian system of hydrodynamical equations." Associate Professor and Professor of Meteorology. Obtained Filosofie Kandidat (1918) and Filosofie Licentiat in Mathematical Physics (1925). Professor of Meteorology and Director, Meteorological Institute. American-Scandinavian Foundation Fellow and Junior Meteorologist, and Assistant Chief for Research and Education. Professor of Meteorology and Andrew MacLeish Distinguished Service Professor. Chair, Committee on Aeronautical Meteorology. Oral history interview with Walter Heinrich Munk, 1997 January 8, September 16, 17, 1998 February 4 and 5. Reid A. Bryson response to History of Geophysics Survey, 1997. The atmosphere and the sea in motion; scientific contributions to the Rossby memorial volume.